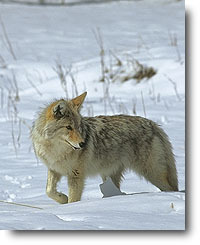 Coyotes have perfected a technique called mousing, where they patiently stalk a mouse and then pounce high in the air and land on it. In winter, they use their excellent sense of hearing to listen for mice running beneath the snow, then pounce up and sharply downward, breaking the crust of the snow with their forefeet to catch their prey. Central Rockies Mammals introduces you to 12 different carnivores with full colour photographs and two to four page descriptions. The guidebook covers grizzly and black bears, mountain lions, lynx, wolves, coyotes, wolverines, martens, mink and weasels.